Now it’s truly annual. 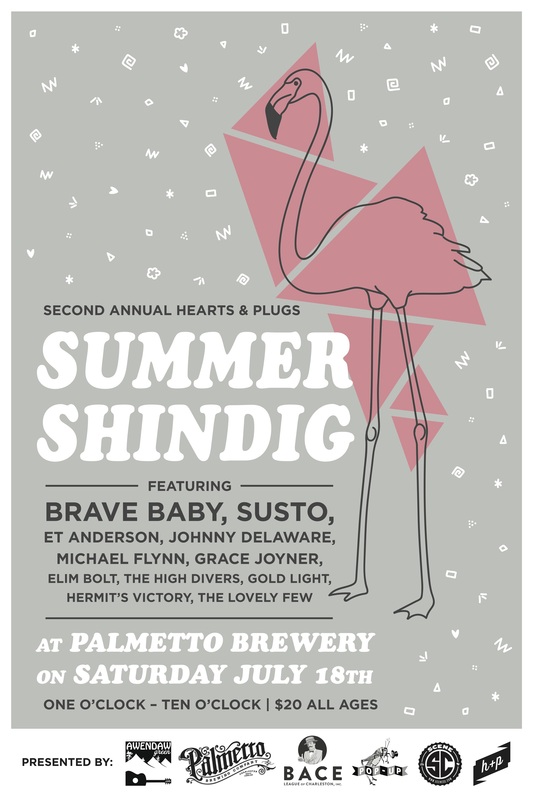 Returning to Charleston after a successful first year is Holy City record label Hearts & Plugs Summer Shindig featuring the label’s full roster of acts. While last year’s event was wildly successful, this years will undoubtedly blow the first one out of the water. Since the event last year Hearts & Plugs, and all the bands on the label, have grown in popularity and are finally starting to receive the recognition they deserve. Headlining the event is Hearts & Plugs anchor act Brave Baby, who are on the verge of releasing their sophomore album—one that already made a splash with a sold out prerelease show at Charleston Music Hall earlier this year. Joining the headliner Brave Baby in not only font size is Susto, who are growing in national popularity quicker than any other South Carolina band at the moment. From there the lineup fills out with equally talented artists, who too deserve more national attention and all deserve a stronger local fan base. Though most of these artists now call Charleston home, it begs to be noted how much this event showcases musicians from all over the state of South Carolina. Follow the roots of each band and they’ll take you to the Upstate for Michael Flynn, the greater Charlotte area for Hermit’s Victory, Grace Joyner and Brave Baby, the swampy suburbs of Florence for Susto and Elim Bolt, the Columbia area for ET Anderson and The Lovely Few, Asheville for Gold Light and the beautiful island of Hilton Head for The High Divers. Never has there been a record label bring together so many artists who so well represent our entire state. As for Johnny Delaware, he’s a beautiful creature of earth and we’re lucky to have his South Dakota booty here making our musicians better and Charleston a better place. This year the event has moved to Palmetto Brewery whose loading dock will serve as a perfect stage for the acts. We’re stoked to be a part of this event and can’t wait for it to sell out. Featuring 11 acts from the H&P roster including Brave Baby, SUSTO, ET Anderson, Johnny Delaware, Michael Flynn, Grace Joyner, ELIM BOLT, Hermit’s Victory, The High Divers, Gold Light, and The Lovely Few.